VANCOUVER - The four Mounties involved in Robert Dziekanski's death "colluded" to come up with a story designed to justify their actions and then attempted to cover up their collusion by lying to a public inquiry, a Crown lawyer alleged Thursday ahead of the perjury trial of one of the officers. Const. Bill Bentley is the first of the four officers to stand trial for perjury for their testimony at the public inquiry into Dziekanski's death. Dziekanski was stunned with a Taser at Vancouver's airport in October 2007. The Crown has asked the judge hearing the case to allow the statements each of the officers made to homicide investigators in the hours following Dziekanski's death to be presented at Bentley's trial. 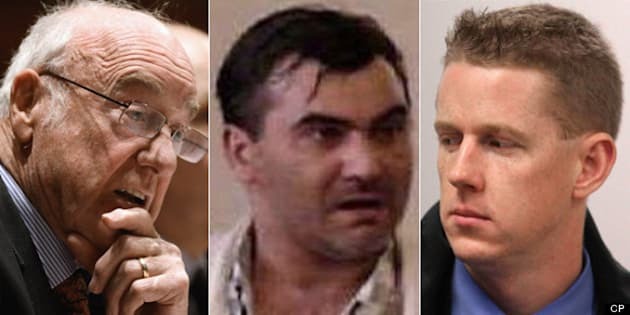 Crown counsel Eric Gottardi said the statements and police notes of all four officers contain the same inaccuracies and often use the same language to describe what happened when they confronted Dziekanski — leading to the "irresistible conclusion" they worked together to create the story they told investigators. For example, all four officers claimed Dziekanski had to be wrestled to the ground and at least two said he appeared to be "fighting through" the Taser stun. A video that came out later clearly showed that Dziekanski fell to the floor almost immediately after the Taser was deployed, he noted. "It's the Crown's theory that these incorrect observations were not the product of any confusion or a genuine mistake, but rather resulted from collaboration between the accused and his fellow officers before providing their accounts (to homicide investigators)," Gottardi told B.C. Supreme Court. "The evidence of the statement shows collusion, and the motivation of the perjury is to cover up the fact that they had colluded together. They had concocted this version of events before the video emerged." Gottardi noted the Crown intends to present the same theory at the trials of the other three officers: Const. Kwesi Millington, Const. Gerry Rundell, and former corporal Benjamin (Monty) Robinson. None of the allegations against Bentley or any of the other officers have been proven in court. Bentley's lawyer was not expected to respond directly to the Crown's allegations until at least Friday, when the defence presents its arguments opposing the Crown's application. Bentley has pleaded not guilty to the perjury charge. The four officers responded to 911 calls about an erratic man throwing furniture at Vancouver's airport in the early morning of Oct. 14, 2007. Within seconds of their arrival, Millington stunned Dziekanski with a Taser multiple times, and the Polish immigrant died on the airport floor shortly after. Dziekanski's death prompted a public inquiry, and all four officers were called to testify under oath. The Crown alleges Bentley lied six times during his testimony at the public inquiry in February 2011, primarily when he attempted to explain discrepancies between an amateur video of the confrontation and what he said in his notes and police statement. He's also accused of lying when he said he didn't recall whether the officers talked about what happened in the time between Dziekanski's death and when they were interviewed by homicide investigators. Judge Mark McEwan, who is hearing the case, raised concerns about accusing the other three officers of collusion when the Crown doesn't intend to call them as witnesses to respond to the allegations. "In order to do that, I have to draw certain conclusions about other people ... without hearing from them," said McEwan in one of many similar exchanges with Crown. "In a sense, you're asking me to collaterally treat all four of them as if they're on trial." McEwan also raised the possibility of "inconsistent rulings" if he reaches one conclusion about the collusion allegations but the judges or juries hearing the other officers' cases decide something different. Gottardi responded that the judge need only concern himself with how the statement affects Bentley's trial. It will be for future courts, he said, to weigh the evidence against the other officers and determine their guilt or innocence. The four officers are each standing trial separately. Robinson's trial is scheduled to start in November, while Millington and Rundell are scheduled to stand trial early next year. Those three trials are currently scheduled to be heard by juries.